Is a Rose Press, 9780989624541, 174pp. Michael Dickel's highly engaging fourth book gathers flash fiction written in recent years--from a series of surreal memoryscapes to flash thrillers to psychological experiments. This hybrid writing blurs genre lines across poetry, fiction, non-fiction, and cultural criticism in an entertaining montage of imagery. The woman with a beard--the unnamed main character of the first series of stories--travels as much in her mind as in the world around her, but somehow all merges with her memories to reveal emotional realities of being human. She and the toad commune somehow, through magical surrealism and mystical physics. The toad provides metaphysical commentary, at times. The garden may or may not exist. 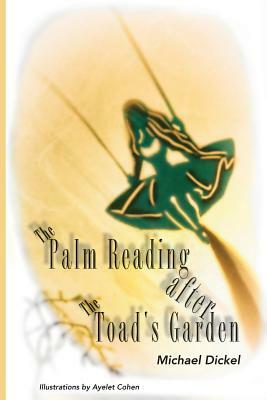 The palm reader in the second series of stories predicts the uncertainty of multiple futures which unfold in the following stories--less connected than the toad's garden, the palm reading follows the many lines of possibility through a collection of slightly more conventional tales. Yet, any conventionality is only on the surface--just beneath, under the cracks in everything, the stories remain surreal, mystical, strange while entertaining readers and exposing the characters' odd humanity. These stories will amuse you as you keep reading, unable to stop yourself from finding out what next outlandish reality will appear on the pages.